Ydson Wisly Andre is thriving in his new school near Cap Haitian, Footprints of the Son. He is growing and very well cared for. His foster family, especially his big brother, loves him dearly. Although the school director feels it is still too early to know what cognitive abilities Ydson has, he is responding well to sensory stimulation and is able to indicate what he likes and does not like. 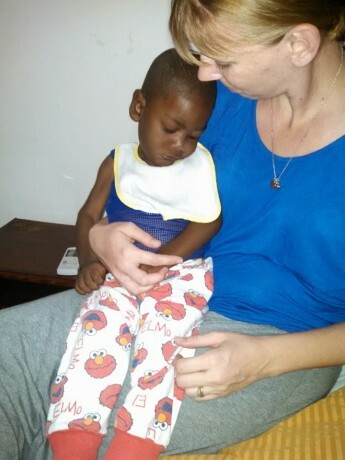 We are all grateful that Ydson is alive because he was not turned away in his hour of need. We wait to see what other miracles God will work in his life. picture is of Ydson with the director of Footprints of the Son. We truly appreciate all donations whether large or small.